Allergic to chalkdust which gets into your nose and lungs? Tired of cleaning the whiteboard and staining your hands with marker ink? Wish the lessons in school were more up-to-date and visually stimulating? Well, perhaps 78-inch computer screens which have replaced blackboards/whiteboards in several schools are the answer. Classrooms in Paris Elementary School have been equipped with 78-inch computer screens that take learning beyond the traditional and dreary. Paris has outfitted all classrooms with the high-tech boards at US$100,000 while several other Colorado schools also use them. 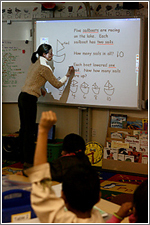 A company which sells the system is Promethean Inc of Alpharetta in Georgio. The company also sells a 98-inch model besides the 78-inch installed by Paris. A fifth-grade teacher, Gywnn Moore, types on the keyboard in a variety of fonts. She can also write directly on the screen in a wide range of colours using a stylus. Her crooked drawing of a shape divided into factions is automatically perfected by the computer. Classroom learning is also connected to the Internet, which literally means a whole wide world of knowledge and resources for young minds. A subwoofer and two speakers render clear diction, besides giving great side effects, to the lessons. But technology is no replacement for effective teaching methodology or classroom management. Making a lesson interesting can be enhanced and aided by technology but it must essentially be complemented by the creativity of the teacher and his/her understanding of the students’ psychology as well as their level of learning. A teacher who uses technology to great effect can do wonders for a lesson and guide the interest as well as the true learning of students. On the other hand, inefficient or misuse of technology – however brilliant – can lead to dire consequences. Students and teachers alike will not be actively involved in the process of teaching and learning in the mistaken notion that technology will do the job for them. Thus, the computer becomes just like a toy or television, and teachers become nannies minding students who are nothing but couch potatoes or viewers. A lot of money would have been invested in applying such technologies in learning institutions, which could have been better spent elsewhere. Thus, a lot of thinking, planning and coordination must take place before new and expensive technology is adopted. This entry was posted on Tuesday, February 6th, 2007 at 5:09 pm	and is filed under Interesting Stuff. You can leave a response, or trackback from your own site. One Response to "High-tech Computers Replace Blackboards in Schools"
Hi, I’m a new buyer, virtuous registered on your forum. I assumption for your dispatch, I chose the normal area – this.